A special thanks to Joe Yerdon of NHL.com for joining Tyler and I for this week’s podcast. We discuss the Jimmy Vesey trade and the likelihood that the Sabres get the young prospect under contract. We also explore the options Tim Murray will have at the draft. This includes who the Sabres may pick at eight and potential trade targets. We end on a bang with a particularly interesting proposal for Sabres fans to mull over. You can listen to this week’s podcast here or via iTunes by following this link. It’s been an interesting deadline season thus far. Plenty of deals have gone down in the weeks leading up to today’s deadline and the Sabres really led the way in that department, sending Tyler Myers, Drew Stafford, Joel Armia, Brendan Lemieux and Jhonas Enroth away in pre-deadline deals. I’ll use this space to track the moves made by the Sabres along with offering up a few quick thoughts on each move. 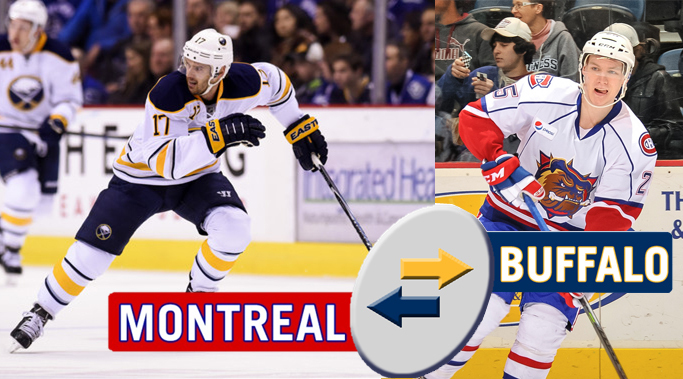 Buffalo acquires a 2016 5th Round pick from Montreal for Brian Flynn Flynn is an RFA, so it’s plausible to assume that Tim Murray wasn’t planning on qualifying him this summer. He’s a very serviceable player and I saw him as a nice fourth line forward once the roster rounded out. He does a good job on the penalty kill and has begun to show some offensive upside in the right situation. Ultimately, Flynn was signed by the previous regime as a college free agent and simply may not be a player Tim Murray saw as a long-term part of his plans. If that’s the case, then by all means try to get as much return for him as possible. It’s still a questionable decision since they’re only getting a 2016 5th, but as a depth player who will be restricted this summer, there’s not much more to ask for. The prayers of the most ardent tank fans have been answered with this deal. Tim Murray saw the goaltender he acquired at last year’s deadline enjoy a fair resurgence over the past few weeks and leveraged his play for an additional asset in the 2016 draft. The Sabres already own the Islanders first and second round picks in the 2015 draft and now own four total picks in the third round of next year’s draft. This was solid return for a goaltender who about a month ago looked as if he was unmovable thanks, in large part, to a lengthy losing streak. This was very much a move for the Sabres’ tank as the Sabres have seen the Coyotes sell off nearly every asset they had in an attempt to nosedive to the league basement. Johnson hasn’t been great this year as Jaro Halak’s backup and now joins Anders Lindback in what is easily the most unstable goaltending duo in the league. Johnson comes in with a 3.08 GAA to complement Lindback’s 3.71. Tank on. Certainly not the return originally expected for Stewart as there were rumors that Tim Murray was requesting as much as a top prospect in exchange for Stewart. In the long run it will probably look like Murray waited a little too long to deal Stewart but landing a second round pick, as far in the future as it may be, is better than taking less than the original asking price. 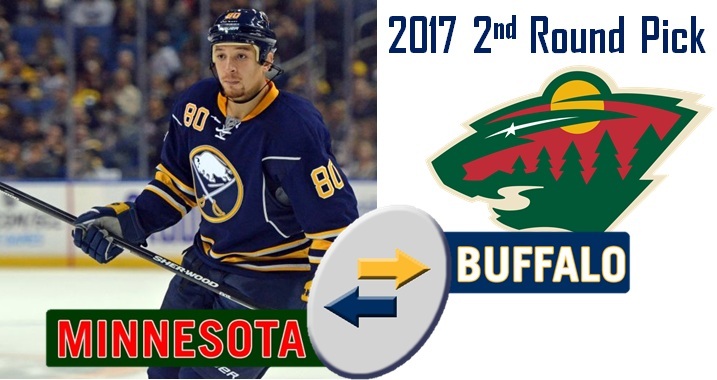 Further, the Sabres already owned Minnesota’s 2016 2nd (which they used to acquire Josh Gorges), so Murray did a good job getting a more valuable pick. I wouldn’t be surprised if Murray’s thought process on acquiring this pick is to provide himself more ammunition for next year’s deadline and future trade offers. As the Sabres sit in a position to really hit the gas on their rebuild, having additional picks to swap is a very good position to be in. This has been a top secret deal (for some reason) since it was announced. Turns out the Sabres grabbed a prospect who has done nothing of substance at the professional and a very late pick in 2016 for Mitchell. This was simply maximizing return for an expiring deal while also pushing another veteran out the door and Murray certainly did that. If Nevins actually plays for the Sabres, I’d be shocked. But, they got an actual body for a player who would typically be pretty worthless in any other scenario. I’ll have a full recap up on today’s happenings soon. We’re nearly a month away from the trade deadline and the rumor mill is really beginning to heat up. The Sabres are expected to sell off a number of players on expiring deals as Drew Stafford, Chris Stewart, Torrey Mitchell and likely one of the team’s two goaltenders will be shipped out by March 2. Tim Murray, however, is in a very interesting position. While Buffalo is firmly a seller this year, he also holds a bucket of picks and prospects that have helped make the Sabres system the envy of the league. Given the sheer number of players in the system, it’s very unlikely that all of the assets the Sabres have stockpiled wind up wearing blue and gold. In fact, Murray has admitted that not every player they’ve acquired or drafted will wind up as an NHL player and it’s up to the Sabres to determine who they need to hold on to. This tells me a few things. First, Murray is very tapped into the assets he has and likely has a very good idea about who he sees as a fit in the near future. Second, he knows that he’s very close to the point of being over-saturated with futures and he needs to start dealing for NHL-ready talent in order to maximize the team’s elite talent and to speed up his rebuild. If things weren’t frantic enough in the land of Sabres trade rumors, Christian Ehrhoff is now said to be on the block in what’s shaping up to be the biggest fire sale this side of the Florida Miami Marlins. Ehrhoff has been a steady contributor on the blueline since he first signed and is easily Buffalo’s number one defenseman. While his contract goes forever, it’s at a very friendly cap hit that allows for quite a bit of maneuverability. Adding his on-ice exploits to such a friendly cap hit makes for an attractive trade chip for a number of competitors. The issue, however, is the Cap Recapture Clause that was included in the new CBA after last year’s lockout. It was built to penalize teams who signed massive, cap circumventing contracts under the previous CBA. It’s a very complicated rule that is difficult to explain but if you read this thread from HF Boards (h/t Scott Michalak @scottyMCSS) on how Ehrhoff’s recapture penalty works you’ll know all you need on how hard the Sabres will be hit if he’s traded. The Olympic trade freeze will lift in two weeks and the ten days to follow will be filled with a flurry of rumor mongering and transactions as the NHL trade deadline nears. 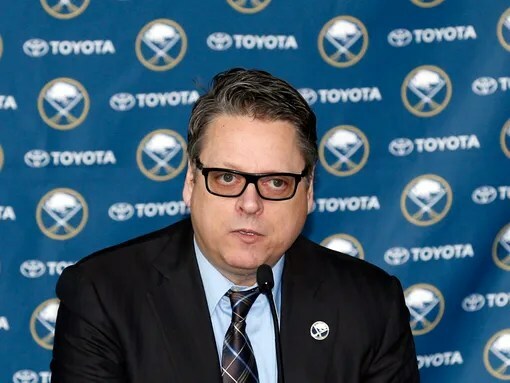 Tim Murray is going to be more than a little busy both during and after the Olympics as he maneuvers to swap some of the talent on his roster as he continues to steer the Sabres rebuild. It’s no secret that his primary focus will be on his trio of pending UFAs with Ryan Miller’s status being of the utmost interest to observers. The end game with those three is all but decided. They’ll be sold off to the highest bidder with Murray attempting to net at least two assets in return for each. In the case of Miller, the asking price will likely begin with four pieces and could end up at three or two depending on what the market bears. I feel that the Sabres are nearing a stage in which picks will not benefit them as much as prospects or players who are nearly NHL regulars. While first round picks are obviously valuable currency, the stockpile the Sabres have been going through should allow Murray to be creative with some of his non-first round picks. Additionally, I’d be in full support of Murray extending some of Buffalo’s younger talents to the trade market in order to make a hockey trade or two in the coming months. This particular strategy being available as an option to him both between now and the deadline and leading up to the draft and summertime.